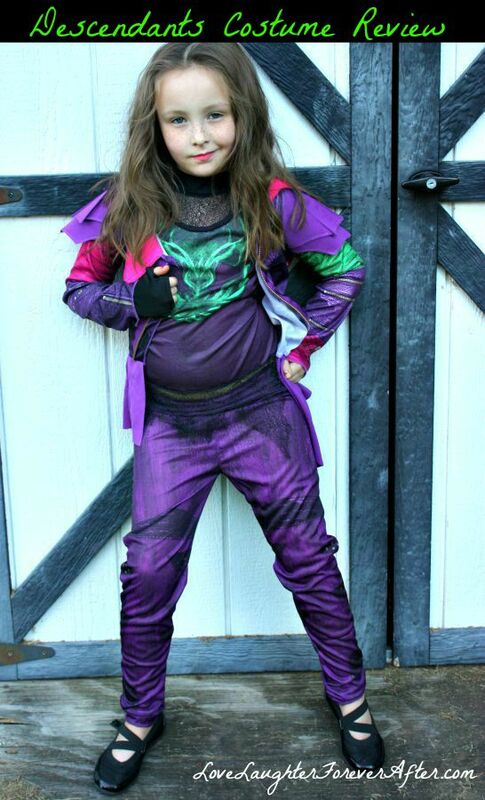 Rotten To The Core With A Wicked Descendants Costume! I know, I know, it’s only September. But I say that if the stores can put Christmas decorations up in September, then I can get excited about Halloween early too! Halloween is my family’s favorite holiday, and we get really into it. Last year we all dressed up as super heros and it was awesome. This year my daughter decided we all should be villains. Which is fine with me because I think they are way more fun. I’m sure if you have little ones who love Disney, you have heard of the hot new movie The Descendants right? Well just in case you haven’t, it’s a movie about the sons and daughters of famous Disney villains. The main characters name is Mal, and she is the daughter of Maleficent and she is pretty awesome. So when we were given a chance to pick out a costume from Costume Discounters to try, we knew we had to get one of the Descendants Costumes for this Halloween! 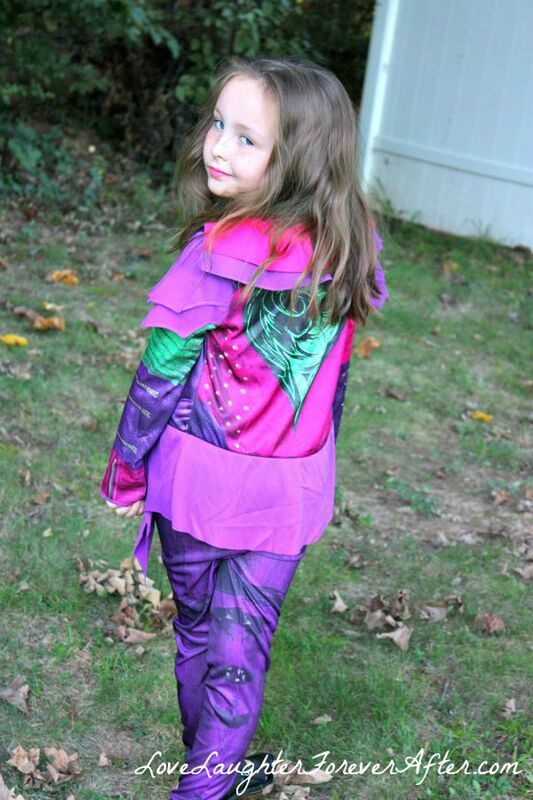 We were super excited (and surprised) when our Descendants Costume arrived a few days after we ordered it. I was always thrilled with the quality of the costume. It had a high quality zipper on the jacket, how bright the colors are, and how well the costume fit. My daughter said it was super comfy to wear too! 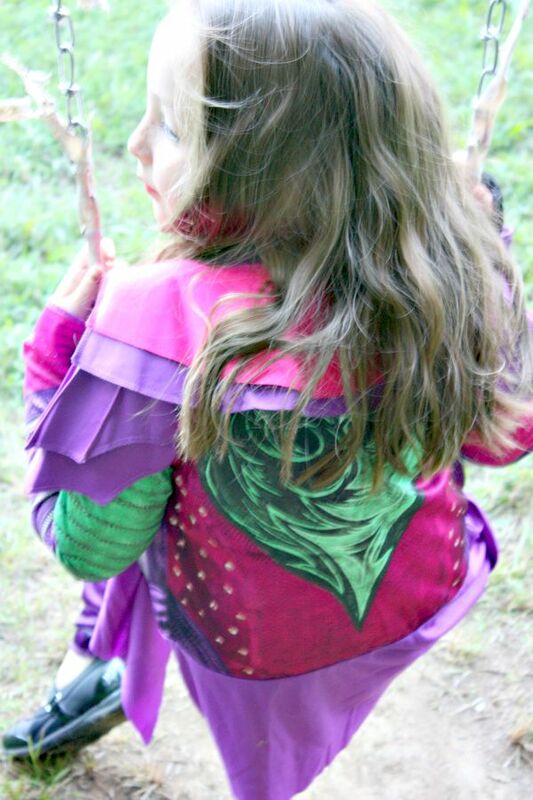 My favorite part of the Descendants Costume was the jacket! It looked just like the one worn in the movie, and the colors are super bright. It also is heavier than I expected which is a good thing. It tends to be cold here on Halloween, so now she has a jacket to wear as part of her costume to keep her warm! If you are looking for cute, affordable Disney Halloween Costumes for 2015 then I highly suggest Costume Discounters, we were impressed and I think you will be too! What is your little one going to be for Halloween this year? That costume is cute, but it’s not nearly as cute as your model! I love that snarky little smirky grin she’s got going on. Adorable! What a cute costume! This is perfect timing. 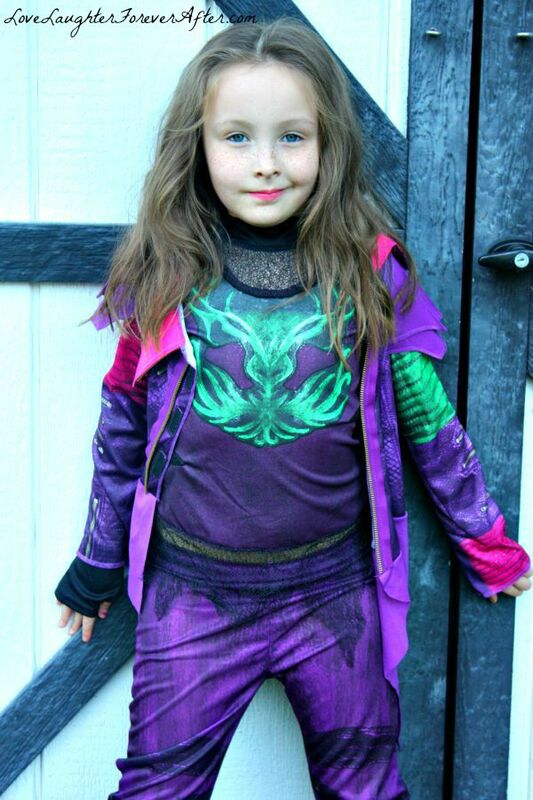 My daughter loves Descendants, and she’s already been asking to be one of the princesses for Halloween. Melissa Pezza recently posted..Why We Love Buying Baby Products from Sam’s Club and a #SamsClubBaby Twitter Party! What a great costume and review. This would be perfect for my 7 year old niece. Everyone seems to love Wicked: Descendants! How cool that your daughter got such a cool costume from it. It is usually chilly on Halloween here too so the coat would be perfect. That is such a cute costume. Her friends are going to be super jealous when they see it. The Descendants on Disney are so popular! Looks like a fun costume! So many kids would be lined up for that one… love the colors too and looks like great quality. This costume is so cute! I love the jacket! Love the sassy but sweet faces! Watch out modeling world! Cute costume. My boys have not decided what they want to be yet which is fine because they will change their minds 500 times between now and then, lol. What a fun costume! She nails the attitude. You have a great model on your hands. This is an adorable costume. I love Mal! My daughter is going to be Mal, but she wants to be the coronation version with the tiered dress. Descendants is such a wonderful movie! I know I’ll see a lot of costumes this Halloween from the movie. This is such a cute one. Cool costume! Love how she models it! Oh how cute. That is a fun costume. I cannot wait to see what my kiddos choose to be for Halloween this year. It’s always such a fun time for all of us! I have heard nothing but good things about this show! She looks adorable in her costume! This is such a cute costume. I am excited for Halloween to come so i can see all the cute kids at the door. That looks like a fun costume. She looks adorable. Your right villains are fun. I had not heard of the descendant (don’t have kids yet, but I’m trying), but it sounds super cute. My daughter loves the Descendents! What a great costume idea for Halloween! I’m afraid I’m behind the times. I hadn’t heard of the descendants! You’re daughter sure is adorable though!